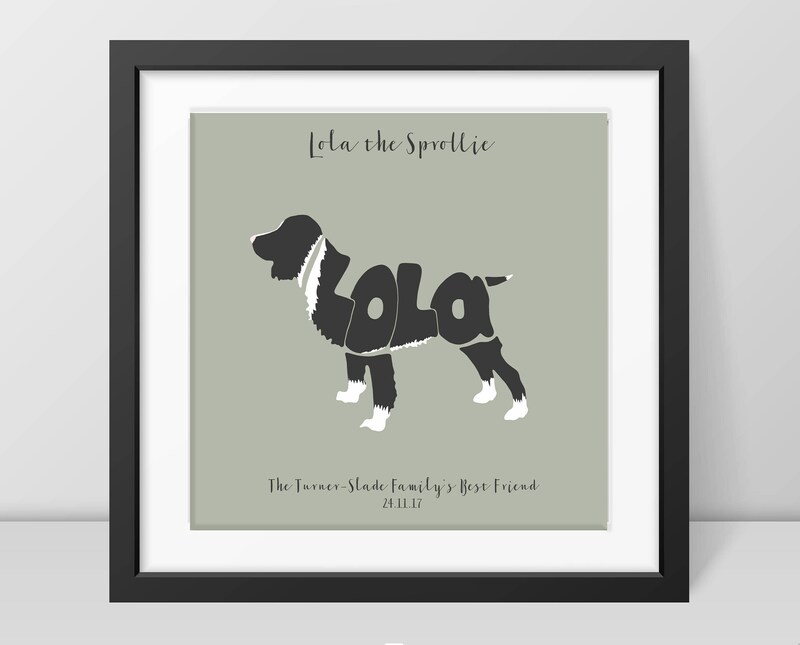 A stunning springer spaniel design that can all be personalised to incorporate your pets name and markings. A perfectly thoughtful, personal gift for your dog loving friend. After all, they call it "puppy love". The prints are beautifully printed and presented unframed or framed in your choice of oak, black or white wood. After ordering, please message us with the name of your springer spaniel and a photo of the dog so that we can see the colouring. Please also provide us with the header and footer text carefully, including capitalisation. The print comes in two sizes, small & large. Please select carefully. If choosing the framed option, it is worth noting that the small size print is framed with no mount and the larger size has a 5cm mount. Use the drop down menu to select your framing requirements. The print will come with the sage background, but if you wish to have another colour please just add it to your message. The springer spaniel designs are printed on 235gsm, Satin Photo Paper. The colours used are sharp and vibrant and stand the test of time, looking great on any wall! Unframed springer spaniel pictures will be dispatched in a sturdy cardboard tube and wrapped in turquoise tissue paper. If you wish to receive the framed print, ready to hang, you can choose from solid oak, black or white frames, and the large size frames come with a 5cm white mount. We're very proud to be able to offer professional, custom made frames for our prints. Each frame is handmade to order, to a very high standard, and comes with all the fixings attached so it is ready to hang. Acrylic safety glazing is used for safety in transit and additional security. If you'd like to receive a proof on email, prior to printing, please say so in your message, but realise that this may slow the order process down.